I've been accused of being a punctual person, at least when it comes to hunting. However, the morning of November 31st proved to be otherwise. Waking up thirty minutes late at camp put me in a race with daylight. I fanatically gathered my gear and bolted out the door, all along trying to figure out how to salvage the day. I considered saving time by going to a closer stand but decided otherwise, because I had hunted that stand the previous day and didn't want to over-hunt the area. Because of that, and the wind direction, I was forced to quickly get to a further stand. As I approached the stand area there was ample light to see where i was going, so I tried picking up the pace without making too much noise. There is a small goldenrod field due west of my stand that I always scan for deer. I spotted two doe about 100 yards away. I quickly stopped and crouched down trying not to alarm them. My first thought was to wait it out and see what might happen. Seconds later, two more does came running down from the ridge above me. As they continued into the goldenrod I heard more deer movement from the other direction. They were running all over the place! It was the first calm day after four days of strong wind and two days of continual rain. I decided to make a move for my stand, about 85 yards away. When I got to the base of the stand, I couldn't believe I didn't hear any deer exiting the area. I quickly climbed up in my stand trying not to make any noise as I got settled. Once there, I carefully started pulling up my bow. Almost in my hands, the bow got hung up on a branch. All of a sudden I heard the sound of aluminum hitting the tree and saw an arrow go cartwheeling towards the ground. " Well, at least I got some fresh air today." was my next thought. When I finished cursing myself, I realized that I didn't hear any deer running from the area so i decided to stay on. After about an hour, I heard deer running below me. Maybe today wasn't going to be so bad. My stand was situated on a hill where three trails merge and continue up the ridge to a bedding area. While I was trying to see the deer below, three does crossed in front of my stand. They had come from the goldenrod field I passed earlier. I anxiously waited for a buck to follow, but the action below came to a stop. I started daydreaming of a 10-pointer I had watched last season. I never got a shot and wanted another chance at him. My dream was interrupted by the sudden sound of antlers locking from the area below me. I listened to the bucks sparring for a few minutes. It was an awesome sound in the crisp morning air. My heart was pounding and my adrenaline flowing. I reached in my day pack, pulled out my rattlig horns and proceeded to start my own sparring match. After a few short series I heard deer coming up the trails. I got my bow ready and focused on a shooting lane. The noise was coming from two does. I noticed that the does kept stopping and looking back as they made their way up the ridge to the bedding area. Eventually I hear more movement. I listened closely and realized it was a buck grunting as he walked up the trail. I was eager to see his rack, but didn't dare move. He stopped about 50 yards down hill from me in a group of small trees. All I could see out of the corner of my eye was a single point. I remember thinking to myself, "That is the biggest spike horn I've ever seen!" He turned and started up the trail. As he moved into my vision I got an eyeful. He was no spike horn! But, more like a 130 class 10 point! My heart was pounding as I tried to remind myself to concentrate on the shooting lane and not the rack. He was on a trail that would give me a nice quartering away shot at about 10 yards. I stood motionless. Finally he stepped into the lane. I drew back my bow and let the arrow fly. It buried to the fletching behind his ribcage, perfect! The buck wheeled around and just stood there, still. I couldn't believe my eyes. He then took one bound, stopped, and again just stood there. Was it possible I missed?? I knew I'd hit him. After what felt like forever, he took one step and collapsed about 20 yards from my stand. I couldn't get down fast enough. 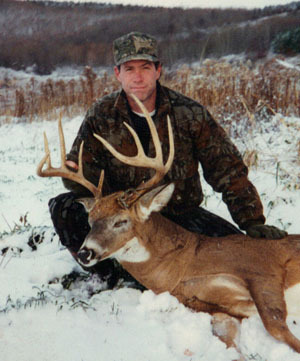 he was a beautiful 9 point buck that ended up scoring 132 7/8 Pope & Young and weighed 195 lbs. For a morning that seemed doomed right from the start, it sure did take a turn for the better.